Hasselblad H2D introduction : A year from the launch of the new Hasselblad, the company is setting a new benchmark for digital professional photography with Hasselblad H2D digital camera, satisfying the needs of both the general and specialist professional photographer. Building on the success of the H1 range of products, Hasselblad has developed the H2 cross-platform camera. The H2D camera includes a series of brand new features, and is fully compatible with Hasselblads existing H system lenses. The new Hasselblad H2D offers photographic professionals the quality of medium-format image capture, combined with the point-and-shoot ease of use, portability and flexibility more often associated with smaller format DSLR technology. The H2D digital camera delivers improved mobility, quality, and workflow. Brand new camera features include a highly advanced image approval and selection tool, called Instant Approval Architecture ( patent pending) providing a swift and easy way to select and classify images. Additionally, Hasselblad has built into the H2 cross-platform camera a new single-battery operation of the camera with the new Ixpress CFH digital back, offering one on/off switch and one operating system, facilitating streamlined, integrated operation. With existing digital backs already in the market, the H2D delivers the exact functionality of the H1. Hasselblad and Imacon : Christian Poulsen, CEO of Hasselblad explains: "In the year since Hasselblad and Imacon joined forces, we have been inundated with constructive feedback from professional photographers worldwide, eager to see Hasselblads legendary quality evolve with developments in digital technology. When we reviewed their wishes, we were able to distil them into five key areas: format, storage, open standards, image approval and selection, and image color refinement. This gave us a clear blueprint for the next phase of our product development." "The result is a new range of technologically advanced products that will change the working habits of general and specialist professional photographers, providing them with the tools they need to capture magical images, while growing a profitable, customer-focused business." 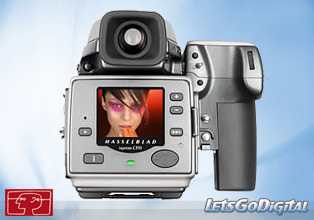 Hasselblad digital camera - 22 Megapixels : Format a new digital camera platform today's professional photographers demand higher resolution, less noise, and improved composition, all of which are addressed with Hasselblads new camera platform. 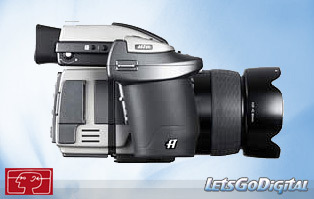 The Hasselblad H2D uses an optical format much larger than 35mm, with a large format, high quality 22 Megapixel CCD sensor measuring 37mm x 49mm. Coupled with an ultra bright, extra large H-size viewfinder enabling better image composition, the final result is image quality that exceeds normal expectations of medium format photography. New products in the Ixpress digital back line include the Ixpress CF and Ixpress CFH, bringing new levels of flexibility to specialist professional photographers, enabling them to take full advantage of everything that leading-edge digital photography can offer. Hasselblad H2D camera - Freedom in storage : Storage three storage modes for ultimate choice and flexibility Optimum portability and image storage are critical for the professional photographer, but have historically been compromised in the digital medium format environment. Hasselblads new products now offer the choice of the portable CF card storage, the flexible FireWire drive, or the tethered operation with extended, special capture controls. With these three operating and storage options, the photographer is able to select a mode to suit the nature of the work at hand, whether in the studio or on location. Adobe DNG format - Hasselblad FlexColor workflow : Open standards redefining the way professional photographers work Hasselblad has partnered closely with Adobe to make its new products fully compatible with Adobes raw image format DNG (Digital Negative), bringing this new technology standard to the professional photographer for the first time. The DNG file format enables raw, compressed image files to be opened directly in Adobe Photoshop CS. This allows photographers to operate quickly and efficiently, reducing the "downtime"taken to process image data and enabling final images to reach the customer more quickly. Hasselblad image files now carry a full set of metadata, including capture conditions, keywords and copyright, facilitating work with image asset management solutions. For specialist commercial photographers the full productivity and creative freedom offered by Hasselblads FlexColor workflow software is also available via importing the DNG file. The new FlexColor now allows the photographer to manipulate color temperature and compare image details across multiple images for precise image selection. Instant Approval Architecture - Feedback tools : Image approval and selection ultimate creative control Limitless digital image capture loses some of its potential if the photographer cannot quickly review and select the best images to present to the client. Building on the success of its Audio Exposure Feedback technology, Hasselblad has created Instant Approval Architecture (IAA), an enhanced set of feedback tools, designed to liberate the photographer to focus on the shoot rather than the selection process. 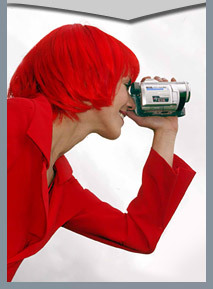 IAA triggers audible and visible signals for each image captured, telling the photographer immediately whether the image has a red, amber or green light status. The information is recorded both in the file and in the file name, providing a quick and easy way to classify and select images, in the field or the lab. Hasselblad FlexColor software : Color refinement new color handling concept Color management solutions have in the past imposed limitations on professional photographers, particularly when capturing various skin tones, metals, fabrics, flowers etc. To combat this, Hasselblad has developed a new, powerful color engine in its FlexColor workflow software. With a one-camera set-up, the new optimized color engine produces reliable out-of-the-box color with smooth gradations, with skin tones and other difficult colors reproduced effectively. Hasselblad H System - Full line professional products : Christian Poulsen concludes: "Less than nine months since the launch of the integrated H System digital product line, Hasselblad is meeting professional photographers changing demands with a revolutionary set of fully-featured cross-platform and integrated digital products. Hasselblad has always set new standards in analogue photography, and by doubling our R and D resource, we are fully committed to being at the leading edge where professional digital photography is concerned. With these new products, we are underlining our mission to work hand in hand with loyal Hasselblad users and new customers to help them take full advantage of the potential that digital technology holds for them, creatively and commercially." 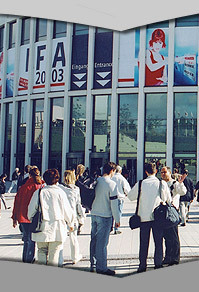 The new Hasselblad products will be rolled out worldwide through Hasselblads national subsidiaries and channel partners in Q3 of 2005.